Researchers on our Saint John campus have been collaborating with Yale School of Medicine and Harvard Medical School to find an efficient way to search biomedical images. 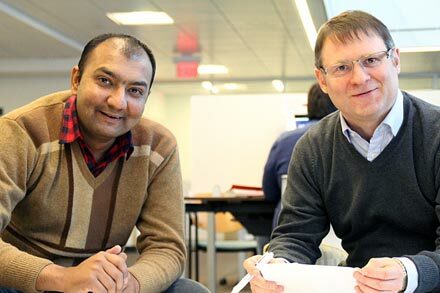 Dr. Chris Baker, computer science department chair, and Ahmad Bukhari, PhD student, were approached by fellow researchers from Yale Medical School interested in collaborating on finding a way to unlock information associated with, and contained in, biomedical images. Yale had developed an image finder portal back in 2008 containing close to two million images including medical illustrations, x-rays, charts and graphs from scientific journals. Maintaining and scaling the portal had become increasingly difficult as millions of new articles are published every year. Traditional methods for archiving these images were not fully automated and needed to be optimized. “This is a Big Data problem. Scientists want to be able to quickly find and reuse images so they can automatically integrate them with other scientific data. What we came up with was a new data management framework based on semantic technologies,” explains Baker. With Baker and Bukhari’s approach the new portal allows a user to first identify a medical image of interest, find related images using a special algorithm and then find the scientific documents from where the images originated. What this means is that scientists will be able to significantly cut down on the time it takes researchers to find relevant scientific information. Baker and Bukhari have already published three papers with Yale and Harvard focusing on their image data management work. Bukhari was the winner of a 2014 best poster at a health conference in Cambridge Mass. and presented a full paper on his work in Cambridge, England in December 2015.